Even as the nation weathers an economic downturn for a third straight holiday season, the majority of Americans are more committed than ever to charitable giving, according to a new American Red Cross poll. A telephone survey of 1,020 adults conducted earlier this fall found that even though 67 percent of Americans didn’t think the economic downturn would last this long, they still want to give to charities, with more than seven out of 10 saying they expect to donate more or about the same this holiday season as they did last year. Four in five (80 percent) of respondents felt their finances are either the same or worse than they were last year. Sixty-eight percent of Americans believe that because of the economy, it’s important to give something to charity. That’s a 10 percentage point increase over the 58 percent who felt that way last year. More than half (55 percent) of Americans say they feel bad about spending money on gifts people might not use. Four in five (79 percent) agreed that they would rather have a charitable donation in their honor than get a gift they wouldn’t use. About one in five (19 percent) of respondents plan on giving blood this holiday season. Despite the tough economy, the survey shows that Americans still feel very charitable during the holidays. Nearly six in 10 (57 percent) plan to give to charity between Thanksgiving and Christmas. In addition, four in five Americans agreeing that helping someone less fortunate is an important part of their holiday tradition. However, of those who would not be donating to charity, most say they either can’t afford do it or they have already given their charitable gifts for the year. More than a third (36 percent) of people say they are not planning to make a financial donation this holiday season, and nearly half of them (49 percent) say it’s because they can’t spare the money right now. This is the third year the Red Cross has conducted a holiday giving national survey, and this new survey shows that people continue to cut back on their holiday spending in a number of areas. The 2011 survey found that 45 percent were planning to cut back on spending for travel and for holiday decorations, 40 percent were reducing spending on parties, and more than a third (35 percent) were cutting back on gifts. The area seeing the smallest reduction was charitable donations, as about a quarter (26 percent) said they were planning to cut back in this area. However, this cost cutting comes with some guilt: 43 percent of Americans reported feeling badly about spending less on gifts for friends and family. The survey found men and women varied significantly on their views regarding charity and gift giving during the holidays. Women tended to be more concerned about giving meaningful and practical gifts, with 61 percent of women feeling bad about spending money on gifts people might not use – 13 points higher than the 48 percent of men who responded that way. While more women than men (70 percent to 61 percent, respectively) say charity helps them get into the holiday spirit, men are more likely to spend more on donations. About a third of men (32 percent) plan to donate more than $100, compared to a fifth (20 percent) of women who plan to donate that much. Men and women also differ on the effects of the economic downturn. Nearly two thirds of women (66 percent) say the economy has helped them focus on what’s important during the holidays, 17 points higher than the 49 percent of men. In addition, more than seven in 10 women (71 percent) say they feel badly they can’t give more to charity this year, compared to 51 percent of men. As Americans look for more meaningful ways to give this holiday season, the Red Cross is offering its 2011 Holiday Giving Catalog, which includes a variety of symbolic gifts, donations that support Red Cross programs. Donors can help vaccinate an entire village, provide food and shelter to a disaster victim, help purchase items like phone cards and supplies for members of the armed forces or help supply basic necessities to families in desperate need in countries across the world. Catalog purchases also come with greeting cards to show others your support during the holidays. The purchase of each gift item is a tax-deductible contribution and provides support to the mission of the Red Cross. Survey details: Telephone survey of 1,020 U.S. Adults 18 years and older on September 29 – October 2, 2011 conducted in ORC International’s CARAVAN® survey using a landline-cell dual-frame sampling design. Margin of error is +/- 3.1 percentage points at the 95% confidence level. The Northeast Wisconsin Chapter serves 20 counties with a mission to prevent, prepare for and respond to emergencies. To learn more about local Red Cross programs, volunteer opportunities, and how you can help, contact the Chapter headquarters at 920-231-3590 or visit www.NEWRedCross.org. Find us on facebook.com/newredcross, twitter.com/newredcross, the local blog is newredcrossblog.org. The American Red Cross shelters, feeds and provides emotional support to victims of disasters; supplies nearly half of the nation’s blood; teaches lifesaving skills; provides international humanitarian aid; and supports military members and their families. The Red Cross is a charitable organization—not a government agency—and depends on volunteers and the generosity of the American public to perform its mission. For more information, please visit www.redcross.org or join our blog at http://blog.redcross.org. Congratulations to Kwik Trip Store # 430 for the Grand Opening. Kwik Trip is located on the corner of Hansen Road and Oneida in Ashwaubenon! 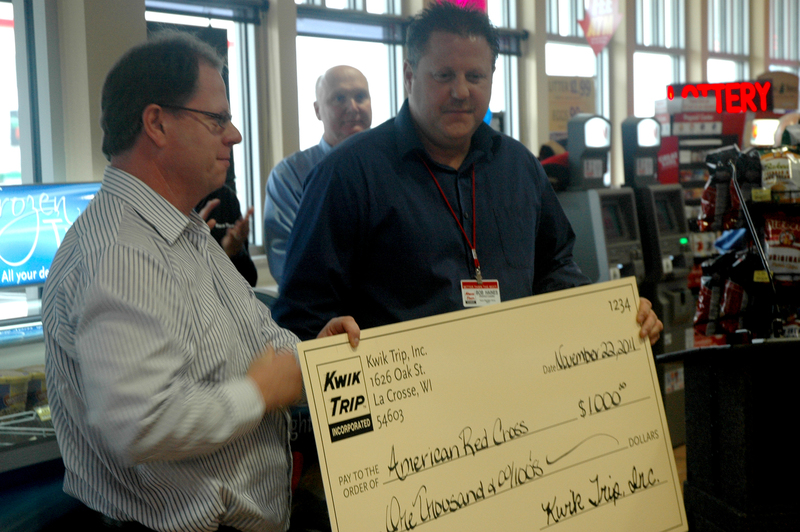 In honor of their Grand Opening, the Kwik Trip employees decided to support the American Red Cross, by joining the one-a-week blood donation program and making a thousand dollar donation to our local Red Cross. Thank you for your generous support of the Red Cross! Take a Red Cross quiz to see if your cooking safety knowledge is up to snuff! If you’re responsible for cooking Thanksgiving dinner, you know how hectic it can be. The last thing you need on the big day is a kitchen disaster, so take our quiz to make sure your holiday stays safe (and delicious!). 1. What is the #1 cause of home fires in the U.S.? 2. What is the primary cause of cooking fires in the home? a. Stay in your home and check on the food regularly. b. Feel free to go outside. Just check on the food from time to time. c. Stay in the kitchen the entire time. a. Stay in the kitchen the entire time. b. Stay in your home, check the food regularly and use a timer to remind you that you’re cooking. c. Feel free to leave the home, but only for short errands. 5. When you’re cooking, how far should kids stay away from the stove? c. It’s ok for kids to be close to the stove, as long as they follow directions. 6. If a fire starts in a pan while you’re cooking, what should you do? a. Move the pan off the stove. b. Beat the fire with a towel. c. Slide a lid over the burning pan and turn off the burner. 7. Which of the following are ok to keep on the stovetop? 0-2 correct: Don’t put your apron on just yet. Read our cooking safety tips first! 3-6 correct: You’re getting warmer—study up on cooking safety and you’ll be frying and roasting before you know it. All 7 correct: Great job! You’re ready to whip up an unforgettable meal. You can never be too prepared, so check out our section on fire safety and other tips. Sue and Tom Schroeder of Neenah were announced as the national Christmas tree contest winners back in August. Their tree, a 19 foot Balsam Fir, planted 18 years ago at their tree farm, Schroeder’s Forevergreens, has been selected to be the presidential Christmas tree in the white house as a result of winning the contest. The Schroeders will present the tree to First Lady, Michelle Obama, and is to be placed in the Blue Room. In addition to her hard work on the tree farm, Sue Schroeder happens to be a dedicated volunteer of the American Red Cross, with her last visit to Washington D.C. following hurricane Katrina. She spent 17 days at the national headquarters as a volunteer where she primarily worked answering questions for local chapters across the country and helped clients that had evacuated. She also worked with a group of volunteers and paid workers that were doing data entry of thousands of client casework forms. Client casework is what Sue has become most familiar with as a volunteer, but her volunteer experience does not stop there. She has volunteered at the local, state and national level for the Red Cross. Sue has been a disaster volunteer since 1998 and has taken all sorts of training classes to enhance her skills and prepare her to be the outstanding volunteer that she is. She was also chairman of the Chocolate Fantasia Fundraiser and a member of the former Neenah-Menasha chapter Board of Directors for several years, rounding out her long list of service. The Red Cross is honored to have such a devoted volunteer and excited to have a local tree farmer given the opportunity to provide the presidential Christmas tree for the white house. The Red Cross could not accomplish the great things it does without all of its wonderful volunteers. Thank you to everyone who has been a part of the Red Cross mission. Happy holidays! The holiday season is just around the corner and this year the American Red Cross is urging people to give something that means something by donating to the Red Cross and helping those in need. The Red Cross has launched a holiday fundraising campaign, asking everyone to visit www.redcross.org/gifts to make a donation in the name of the people on their gift list this year. Their donation can help provide food and shelter to a victim of disaster, help purchase things like phone cards and supplies for a member of the armed forces, or help supply basic necessities to families in desperate need in countries across the world. Everyone is invited to browse through the Red Cross Holiday Giving Catalog and view symbolic gifts they can “purchase” for, or in honor of, a loved one – things like infant care kits for babies in emergency shelters, comfort kits for wounded warriors, or water containers used when natural disasters disrupt a community’s water supply overseas. Throughout our local Chapter area, we funded 210 local disaster operations which was up from 163 local disasters (mostly residential fires) last year. This increase can only be supported through disaster training, material readiness, preparation and rapid responses around the clock. With the military gifts being popular, of interest is that 2,100 services were provided to local military members and their families. We also trained 50,072 in life-saving skills such as first aid, CPR, water safety and babysitting classes to name a few. Fiscal Year 2011 was a busy year nationally for the Red Cross. Red Cross chapters responded to more than 68,000 disasters across the country, including the launch of major relief operations for wildfires that burned hundreds of thousands of acres; tornadoes that destroyed entire towns; and flooding that left communities underwater from the Dakotas to the East Coast. Red Cross Service to the Armed Forces workers provided assistance to more than 386,000 members of the military and their families, veterans and civilians. Red Cross Blood Services distributed more than nine million blood products for patients in nearly 3,000 hospitals across the United States. The Red Cross enrolled more than 8.2 million people in health and safety training such as first aid and CPR, aquatics and water safety. As part of the global Red Cross network in more than 180 countries around the world, the American Red Cross responded to disasters and public health emergencies in more than 60 countries. The American Red Cross shelters, feeds and provides emotional support to victims of disasters; supplies nearly half of the nation’s blood; teaches lifesaving skills; provides international humanitarian aid; and supports military members and their families. The Red Cross is a charitable organization — not a government agency — and depends on volunteers and the generosity of the American public to perform its mission. For more information, please visitwww.redcross.org or join our blog at http://blog.redcross.org. The Northeast Wisconsin Chapter celebrates its life-saving mission by recognizing volunteers and donors alike. 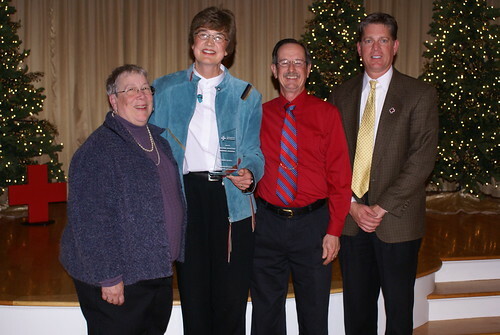 November 16, 2011 – Last night, American Red Cross volunteers and community partners were honored with service awards at the annual Celebration of Support. The American Red Cross is driven by volunteers to provide relief to victims of disaster and help people prevent, prepare for, and respond to emergencies. The Celebration of Support is one way to thank and honor volunteers for their contributions down the street, across the country and around the world. 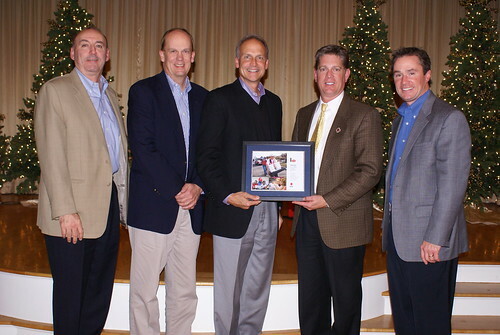 Bemis Corporation received our Community Partnership Award and special certificate signed by American Red Cross CEO, Gail McGovern, for their support of the American Red Cross' aid to the victims of the Joplin, MO tornado. Setting the stage for the evening was a first hand account of the killer tornado which hit Joplin, Missouri earlier this year. Although 900 tornadoes touched down in April, this one storm was responsible for hundreds of lost lives – yet the response and on-going recovery is a message of strength. Sharing a Fox Valley perspective was Bill Austen, from the Bemis Company Foundation which has a manufacturing plant in Joplin. While the plant was undamaged, several of their employees escaped the winds with just clothes on their back. Their story demonstrated the need for local preparedness and the strength and appreciation of trained Red Cross staff and volunteers who rapidly arrived to support emergency needs. Volunteers make up 97 percent of the workforce for the American Red Cross. Three volunteers, Joyce Keyes and Linda Michels (Fond du Lac) and Gloria Wachholtz (Oshkosh) received 5-year pins while MarJean Buck, Neal Buck (Fond du Lac) and Greg Gibbons (Oshkosh) received 10-years of service pins. The Exceptional Volunteer Service Award for Community Programs is granted to a volunteer who has proven exceptional performance and enthusiasm toward the community programs at the Red Cross. 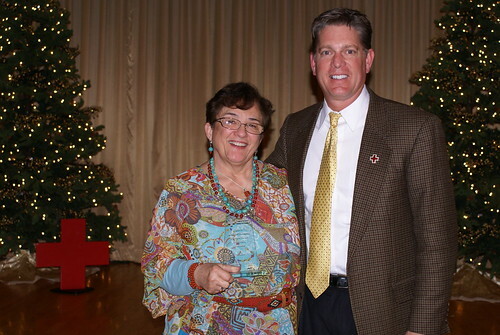 This year’s recipient was Dixie Laehn, who volunteers each Monday for the Bridges program. 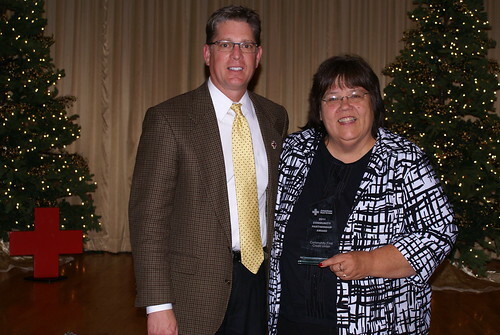 Congratulations to Dixie Laehn for receiving the 2011 2011 Exceptional Volunteer Service Award for her work with our Community Service programs. The Exceptional Volunteer Service Award for Blood Services is presented to the individual who has shown exemplary effort and dedication with regard to volunteering in the blood services program. This year’s recipient was Edna Mae Cragin who has chaired two Montello blood drives per year since 2006 and has helped save up-to 3,615 lives. The Exceptional Volunteer Service for Health & Safety Services is presented to the individaul who has show exemplary efforts and dedication to teaching and promoting our life saving training within the community. This year’s recipient was Bob Mayer, honored for his flexibility and his ‘can-do’ attitude that is so appreciated. 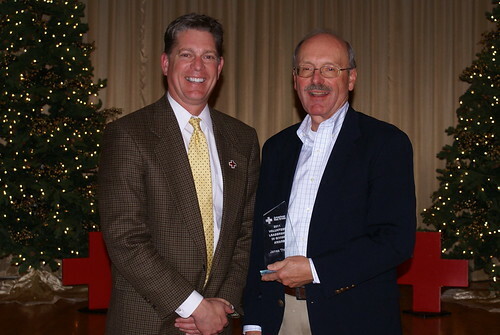 Congratulations to Bob Mayer for receiving the 2011 Exceptional Volunteer Service Award for his work with our Preparedness, Health & Safety Program. The Exceptional Services Award for Services to the Armed Forces is given to the individual who plays an important role in the local to global support of veterans, military members and their families. This year’s recipient was Linda Bishop from Appleton who provides 24/7/365 emergency communication support for service members and their families while in crisis. 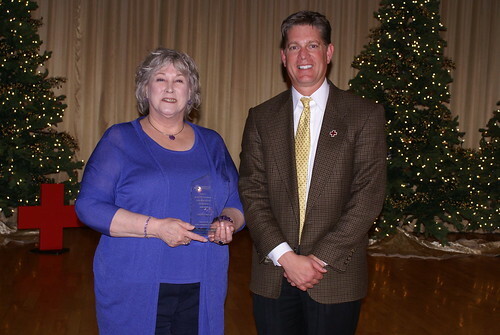 Congratulations to Linda Bishop for receiving the 2011 Exceptional Volunteer Service Award for her work with our Services to the Armed Forces program and for helping with general office support at our Appleton location. The Special Employee Recognition Award was given to Nick Cluppert,who has spearheaded our Services to Armed Forces and disaster preparedness and response programs. He was recognized for his management skills, excelling in disaster training and his disaster deployments around the country. 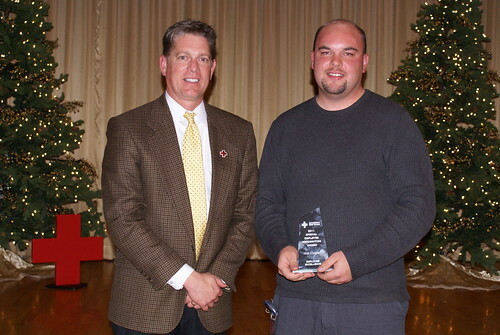 Congratulations to Nick Cluppert for receiving the 2011 Special Employee Recognition Award. The Exceptional Services Award for International Services is granted to a volunteer who portrays exceptional effort in promoting Red Cross services worldwide. This year’s recipient was is the Nakashima family, who rose to the occasion to support the people ofJapan after the Earthquake, Tsunami, and Nuclear incident devastated the country many family members call home. The Community Partnership Award is awarded to any company, agency or organization that actively collaborates with the American Red Cross to improve the welfare of the community in which they are part. This year’s recipients were J.J. Keller, Menasha Corporation, Bemis Corporation, Community First Credit Union and State Farm. Congratulations to Community First Credit Union for receiving our Community Partnership Award for outstanding support of our special events.Congratulations to State Farm for receiving our Community Partnership Award and many thanks for sponsoring our Celebration of Support event! The Leadership in Giving Award is presented to a person who exemplifies philanthropy throughout his or her life. This year’s recipient was Jim Thomas, (Fond du Lac) who has volunteered with the Red Cross for more than six years, served as Chapter chairman and led a five-year strategic plan. 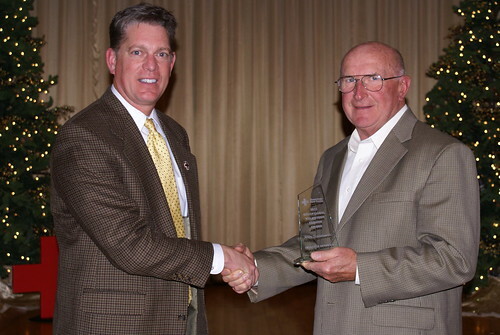 Congratulations to James Thomas for receiving the 2011 Volunteer Leadership in Giving Award. Two Exceptional Services Award for Disaster Services were presented to individuals who illustrate extensive personal commitment to helping those in need of emergency assistance. This year’s recipient include Andrew (Andy) Stanislawski, (Waupaca) who has been a dedicated local and national disaster volunteer including multiple deployments this year alone. He also supports the Waupaca office, works at blood drives and is always ready to lend a hand. The second award was presented to Neal and MarJean Buck. They both serve as Fond du Lac area Disaster Action Team captains and their dedication was not deterred when their own home flooded yet they spent five days working full time helping neighbors in need before they tended to their own basement. 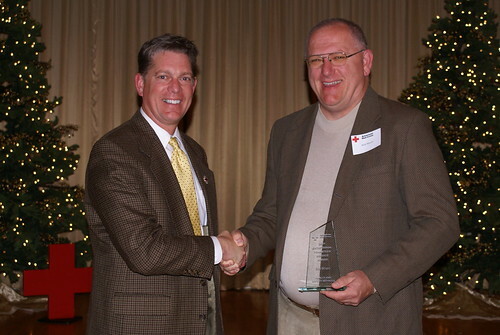 Andy Stanislawski received the 2011 Exceptional Volunteer Award for his work with our Disaster Services program. Congratulations! 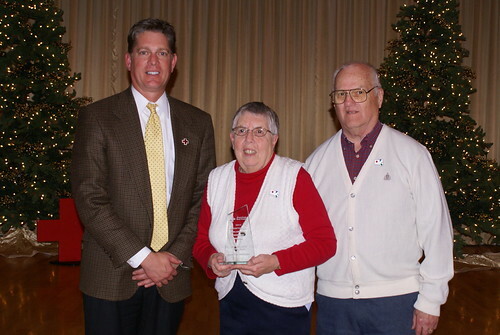 Congratulations to MarJean and Neal Buck for receiving the 2011 Exceptional Volunteer Service Award for their work with the Disaster Services program. The Clara Barton Award, one of the highest honors bestowed by the Red Cross, is presented to a volunteer whose performance in a number of leadership positions and personal expertise has enabled the Red Cross to contribute valuable services to the community. This year’s recipient was Vicki Jenks, from Wild Rose, WI who has spearheaded local Heroes efforts, rallies community engagement and serves on the Board of Directors. Congratulations to Vicki Jenks for receiving the highest honor of the evening, the Clara Barton Honor Award. This award is given to an indvidual who mimics the true humanitarian spirit of American Red Cross founder, Clara Barton. Kristal Wiese of Redgranite and the Wautoma High School Key Club are partnering with Vicki Jenks and the local Red Cross to create and assemble Child Comfort Kits for the Red Cross to distribute to children in their time of need. The Key Club is seeking the assistance of the community to donate the following items to be assembled into kits. Items in demand: coloring books, crayons, colored pencils, pencils, hand held pencil sharpeners, washcloths, bars of soap, shampoo, conditioner, toothbrushes, toothpaste, combs, small bags of tissues, stuffed animals and cash contributions. All stuffed animals are acceptable. All “less than perfect” stuffed animals will be shared with WHS Upward Bound for their donation project to benefit local Animal Shelters. Both community service projects are running concurrently. Donation locations in Wautoma: Stoneridge Piggly Wiggly, Pamida, Copp’s, Hometown Bank, Culvers Restaurant, Christianos Restaurant, Parkside School and Wautoma High School. Redgranite locations: Redgranite Library and Little Sprouts Discovery Center. Donations are accepted now through December 2nd. Please direct cash contributions to the local business owner or contact Jennifer Culver at 920-570-1704. The WHS Key Club is also scheduled to assist Pamida with decorating their Live Giving Tree and ringing bells for Salvation Army this holiday season. The Key Club thanks you for your support and partnering in their community service projects, for the greater good of our community.